You are here: Home >> News >> Conference & Exhibition >> Exciting! Which Products Are the Pharmapack Awards Winners of 2019? Exciting! Which Products Are the Pharmapack Awards Winners of 2019? Eco-Friendliness, Compliance to dose regimen and users Safety. With some 12 improved or new features added to the package, the move towards this improved secondary packaging solution is perfectly fitting with UCB strategy that aims to render UCB operations carbon neutral by 2030, and to impact user’s journey by translating superior insights into user value. The package incorporates new and innovative packaging features that shift the paradigm of pharmaceutical packaging based on actionable insights collected – most of them focusing on package size, recyclability, sustainability, wastes. Some insights collected were covering nurses safety and compliance aspects too. The third-generation Connected Health Platform (CHP) from Phillips-Medisize, a Molex company, helps pharmaceutical companies and drug delivery device developers reduce risk, cost and time to market with leading innovation and technology accelerators. This cloud-based platform provides a safe, scalable and trusted medical device data system (MDDS) built on technology from the world leader in health data interoperability. It encompasses extensive information-sharing, analytics capabilities, robust cybersecurity and streamlined regulatory documentation. Its advanced analytics package is designed for connected drug delivery devices, biosensors and regulated Mobile Medical Applications (SaMD/MMA). Ultimately, connected health solutions may help patients improve medication adherence and manage chronic conditions. Push Tab® is an alternative opening for strip packaging. The Push Tab® material for strip packs makes it easy to remove tablets simply by applying pressure. Featuring top barrier properties and various seal layers, the revolutionary material from Huhtamaki offers the option of a child-safe packaging solution. The barrier properties are not affected in any way as a result of pushing through the film and guarantee the highest levels of product safety. Different versions and forms ensure adequate market differentiation and are an interesting alternative to blister or cold-form applications. It’s main benefit for these applications is to be PVC free, cost effective as well as with only one specification suitable for all different climate zones. Recyclable version are under development. IQ-Dose (intuitive and quick-dose) is an efficient, easy-to-use device made for dosing and counting mini-tablets. It is especially useful during trial phases for paediatric medicine, but also for specific treatments such as Parkinson’s disease, oncology treatment, psychiatrics and more. This new solid form of pellet allows the administration of tiny doses, exactly adjusted to a patient’s needs; the disadvantage, however, is that the small size of the pills make them difficult to count. The IQ-Dose is a new solution for overcoming these difficulties. Hygienic and accurate, the device allows the selection of the exact quantity of mini-tablets prescribed, from one to 24, in one go, without the need for any contact with the hands. SCHOTT’s new syriQ BioPure® prefillable glass syringes were designed specifically for the biologics market, keeping sensitive drugs stable, easing administration and shortening time to market. The improved drug stability is reached through enhanced manufacturing processes, which lead to ultra low tungsten level and low adhesive residuals resulting in reduced risk of potential interactions with other materials. Additionally, a homogeneous silicone layer ensures a consistent gliding performance, which is essential to ease administration for the patient. Superior functionality is achieved through tighter dimensional tolerances and a verified compatibility with safety devices. The syringes are made of FIOLAX® borosilicate glass and are available in more than 48 pre-validated configurations. Aptar Pharma QuickStart™ is an innovative way to deliver injectable development solutions to pharmaceutical customers, demonstrably accelerating bench-to-market time. Designed specifically for R&D labs, Biotechs, Start-ups and Universities, QuickStart™ provides everything needed for the small volume filling of high value formulations. QuickStart™ combines best-in-class components from Aptar Pharma, Schott and EMA, enabling innovators to benefit from multiple configurations shipped from a single source, and available to order through a convenient e-commerce portal. These components satisfy all regulatory requirements, allowing developers to access commercial scale quality at development stage costs, meaning performance at project outset can be maintained at scale up. In June of this year, these latest packaging products from all over the world will come to Shanghai for their first show in Asia. Want to talk face to face with these innovative technology suppliers? 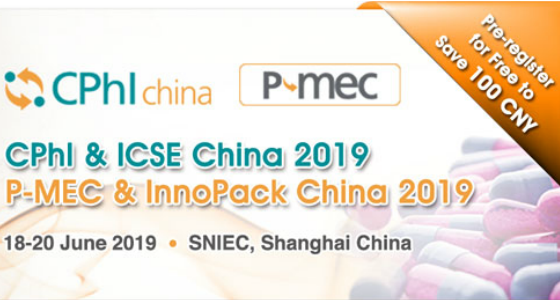 Please don't miss the InnoPack China 2019 held in Shanghai New International Expo Center from June 18 to 20, 2019. Register as Visitor to InnoPack China & CPhI China 2019!